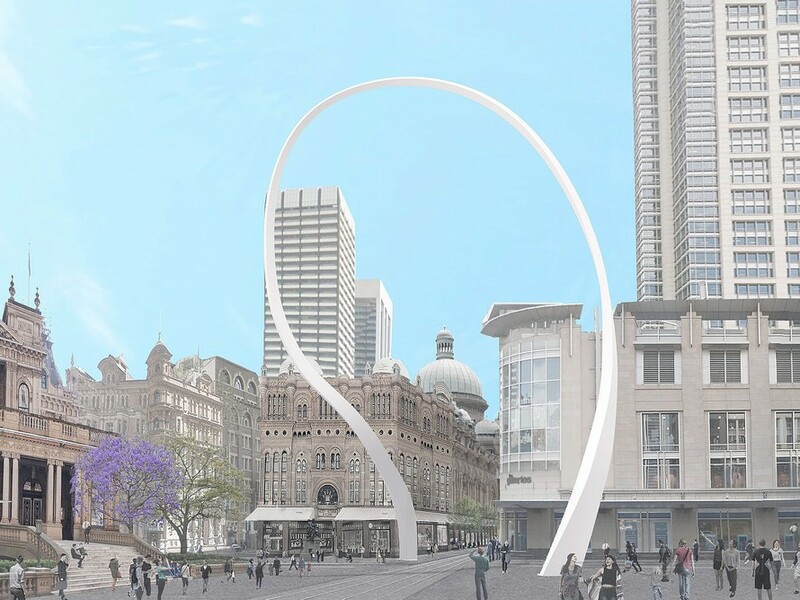 When the City of Sydney’s public art plan for the newly revamped CBD was unveiled in 2014, the public response was mixed. There was a relatively muted reaction to Tracey Emin’s project that will see dozens of handmade bronze birds perched atop buildings and doorways, and outright derision from some quarters at the concept of an oversized, upturned blue milk crate reimagined as an inhabitable pavilion in Belmore Park. But Junya Ishigami’s towering Cloud Arch, the most ambitious project in scale and cost, was almost unanimously applauded. Three years on – after the council announced it would rubber-stamp the project despite a cost blow-out from $3.5 million to $11.3 million - the public response has changed its tune. The final design traces a wispy, ethereal line that reaches up to lasoo and frame the sky above, offering a variety of views from different perspectives. Visually, it delineates a welcome breathing space between the building clutter and congestion of central Sydney. The recent criticisms of Cloud Arch superficially attack the design itself, yet are founded on a culturally entrenched, mean-spirited attitude to public art in Australia. Some mainstream media commentators have admitted as much, saying that they don’t actually mind the design. Offering an element of wonder and whimsy, at its best, public art can vitalise people’s everyday experience of the city. Yet as Sydney has seen in recent weeks, it can also be divisive: opinions are rarely in the middle. Why is art in the public sphere rated as such a low priority by Australians at home, who, when travelling overseas likely make a beeline for iconic public art works such as Berlin’s Memorial to the Murdered Jews of Europe ($37 million, launched in 2005), or Chicago’s Cloud Gate ($30 million, launched in 2006). Like Sydney’s Cloud Arch, when Anish Kapoor’s Cloud Gate was announced for Chicago in 2004 it was met with skepticism. Its budget was originally set at $7.5 million – more than twice the original cost of Sydney’s Cloud Arch – though, like Cloud Arch, numerous engineering and other challenges saw the required expenditure substantially increased. It is now the most visited and most photographed public art work in the world. Indeed when the Eiffel Tower was built in the late 19th century, it attracted wide and vocal opposition from the intellectual elite of Paris. A letter was sent to the Minister of Works protesting against construction of the “ridiculous tower” that would dominate Paris like “a gigantic black smokestack”. Signatories to the petition included author Guy de Maupassant and his circle of cultural connoisseurs. Roland Barthes tells the story of De Maupassant hating the Eiffel Tower so intensely that he often took lunch in the restaurant at its base, not because of the offerings on the menu, but because it was the only place in Paris where the author could avoid seeing the offending edifice. A generation ago, when Sydney was announced as host city of the 2000 Summer Olympic Games, a mere $7.5 million was allocated to the commissioning of public art for the new Homebush site where the games would be centred. The budget was about a quarter of the amount spent on public art by former Olympic host cities such as Seoul and Barcelona. Australians displays a consistently miserly approach to public art, with typically miniscule budgets requiring artists to respond with agility to find practical ways of achieving their vision. Renowned public space artist Janet Laurence responded with a native habitat on the banks of what was a remediated toxic swamp in Olympic Park. A key component of her multi-faceted work, In the Shadow (1999) was the mass planting of native species that would have once been abundant at the site. When she was contacted some years later by the Sydney Olympic Park Authority and advised that the trees required pruning because they were obscuring the view from the road of the Tennis Centre, Laurence explained that the trees could not be touched because they were, in fact, art. To this day, the authority only attends to the trees in consultation with the artist. Cities are defined by their architecture and art in the public realm. While it is true that city authorities often turn to public art as an expedient way to adorn public spaces, successful public art will also provide the city’s residents, workers and visitors with landmarks, meeting places and tourist destinations. As the Sydney Opera House approaches its 50th birthday, it is high time for Sydney to once again demonstrate its cultural leadership with an ambitious work by an internationally acclaimed artist. Cloud Arch will achieve this, and in comparison to major public art around the world, its price tag is very reasonable.